My friend Dan and I had been interested in paddling the Paringa for a while. 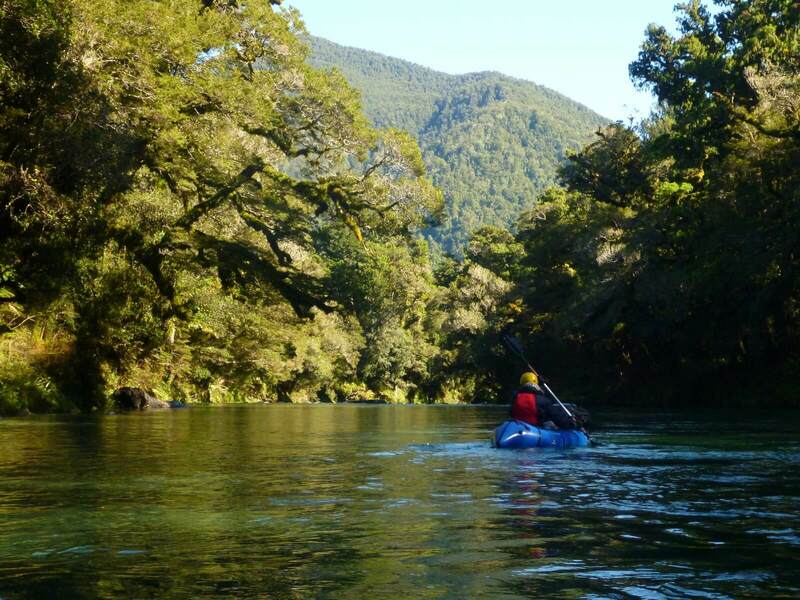 Most medium and small rivers in South Westland are relatively steep and bouldery, which ruled them out for us, as neither of us are hard paddlers. However the Paringa piqued our interest as, heading up, it does not gain much height all the way to the headwaters. Only 100m in 16km. This indicated it would be a managable grade most of the way. Searching online failed to unearth any information about previous descents, which only added to the excitement. Having never been on a river I had no information about before, I was thrilled at the prospect of getting up there and scouting it out oursleves. With a perfect forcast of heavy rain on the first day for the walk in, and a clear still day for the paddle out, we started our soggy walk on the true left of the Paringa across Ben Monk’s farm (permission required; ph 037510899). At first we mainly crossed grassland, with the odd vaguely tracked bush section around small bluffs. At the first of these, a couple of bemused possum trappers helped guide us through the best route, while pondering how much venison they could fit in a packraft. On account of my two-piece paddle sticking high above my already tall self, I chose a dodgy skirt along the riverbank whenever possible rather than attempting entanglement in the thick bush. This was not always possible, however Dan’s helpful comments about the benefits of a four-piece paddle certainly made being stuck in scrub more tolerable. The Paringa River up until the Otoko confluence is relatively wide and slow, with the odd easily visible grade one rapid, so does not require any in-depth scouting on the walk in. However, above the confluence the Paringa gets narrower and steeper. As this section is all bush on either side and the track is not always beside the river, we made frequent detours to check on the river. It revealed itself as a very runnable grade 1 for the most part with frequent managable grade 2 rapids. We had been worried about not enough flow in the river, but the heavy rain was helping, and for the most part appeared free of boney sections. The river was very appealing here, and we were getting very excited to get paddling the next day. About 2km down from Tunnel Creek Hut at the head of the valley, we came across a substantial drop in the river which was unrunnable for us and would probably require heavy rain for better paddlers to run. Above here we could probably paddle parts of the river but it was quite boney so we decided that we would start paddling from below that river drop the next day. Tunnel Creek Hut is an old Forest Service 6-bunk hut, located in a beautiful clearing looking up into the mountains at the head of the Paringa valley. It had been slowly falling into disrepair until a few years ago when Geoff Spearpoint took it apon himself to maintain it. It now has a new lease on life thanks to Geoff and his various helpers, and is in excellent condition finished with a lovely coat of Forest Service orange. Its a great place to go, even without the packrafting. The next day dawned fine and clear, thanks to a lovely (for the West Coast) easterly, with some clouds at the head of the valley which never quite managed to make it towards us. We were excited to see what the river was up to and how much the water level had dropped since the heavy rain the day before. The top two kilometres from the hut looked fun if there was more water, probably in spring, but were just a bit too boney for us, especially with a big portage further down around the big rapid. As we were inflating our boats and getting our gear ready for paddling beside the river I was getting very excited. It was thrilling not to have any firm beta on the river and knowing we would have to scout it out as we went. The unknown is what makes outdoor adventures so exhilirating. We were lucky it was such a dry hot day, especially for me as it was the last packrafting trip I did in thermals, fleece, and a raincoat before acquiring more substantial insulation. It was a beautiful spot to get ready, underneath the beautiful beech forest, next to the clear clean water. We couldnt ask for a better spot to go paddling. As this was my first overnight paddling trip I had been a bit apprehensive about paddling with the extra weight on the front, but once we were on the water I realised that a few extra kilograms wasn’t going to make much of a difference. The first few rapids were an easily runnable grade 1, sometimes between boulders sticking out of the water with the odd tree in the river to keep you focused. After 30 minutes or so we came to our first grade 2 rapid, which required a wee scout before commiting to. There were 4 or 5 of these. They all involved numerous rocks sticking out of the water with various criss-crossing paddleable lines running inbetween them. This easy rock dodging and eddy catching was highly enjoyable. Dan is a lot more experienced than me, so he spent a bit of time in this section showing me a few tricks with paddling in rapids. The main point I learned was to always move proactively and positively in the direction you want to head in, rather than float down the river passively waiting for the river to push you in various directions and then having to react aggresively when it pushes you where you don’t want to go. I felt a lot more in control going down rapids once Dan had drilled this into me. After 2 hours or so the river started to flatten out, and does a giant S bend above the Otoko confluence. It was here we passed our first bewildered cattle. Obviously packrafters are not a regular sight for them, and the look on their faces was similar to me if I had seen a UFO dropping hunters off at Tunnel Creek Hut. I like to think that after we passed, the cattle shook their heads and swore off the funny coloured mushrooms they had found on that log. This section allowed us to lie back and appreciate where we were and what a cracker of a day it was. There were however a few huge log jams near large riverside morraine cliffs, which required careful navigation to paddle through to avoid underwater logs. These and all the rapids above were easily portageable, so there had been no worries about having to commit to dodgy rapids. The river became a lot murkier after the confluence with the glacier fed Otoko River, and also wider and slower. It bacame a beautiful float with the odd near capsizing through inattention going down some of the easy grade 1 rapids. We passed a lot more bewildered cattle, with the calves thinking we were the most exciting and terrifying things they had ever seen. After about an hour of this, we paddled under the road bridge and hopped off the river at our car parked near the Thomas Brunner memorial. How astonished he would have been to see us floating for fun on the river with a 3 hour, fish and chip fueled drive back to Wanaka, rather than his 8 month near-starvation slog back up to Nelson. The trip had been successful, we had explored a river we knew nearly nothing about, and spent a day in beautiful weather on the West Coast, which is always a bonus. I would recommend doing this trip, it could probably work as a long day trip, but it is worth making the most of it and staying at the Hut as well.